Election Day is less than three weeks away, but for millions of Americans it’s already arrived. More than 4 million voters already have cast early, absentee and mail-in ballots, and if the trend of recent presidential election cycles continues, the number of people voting in such nontraditional ways could top 50 million by the time all the votes are counted. The share of the total electorate that such nontraditional voting represents has grown rapidly over the past few election cycles. In 2004, according to our analysis, about 22% of the total vote was nontraditional; by 2008, nearly a third was. Those findings are broadly in line with the Census Bureau’s post-election surveys, which ask people whether they voted on or before Election Day and whether they did so in person or by mail. In 1996, the first year those questions were asked, 10.5% of voters reported using what the Census calls an “alternative” method – either voting by mail or in person before Election Day. By 2012, the alternative-voting share had risen to 32.8%. Early voting, absentee voting: What’s the difference? Absentee voting with an excuse: This original nontraditional voting method allows voters to cast a ballot before Election Day under certain circumstances (sickness, military service and others). “No-excuse” absentee voting: Expands upon traditional absentee voting by not requiring absentee voters to offer a reason why they can’t vote in person on Election Day. Voters generally must apply to use this option. Early voting: Enables voters to cast a ballot before Election Day at an elections office (or, in some instances, at a satellite voting location) with no excuse needed. “In-person” absentee voting: Similar to early voting, allows absentee voters (excused or no-excuse) to fill out and drop off their ballots in person, rather than through the mail, at any time before Election Day. Permanent absentee voting: Allows voters to join a permanent absentee voting list. Once on the list, voters are automatically sent mail ballots for all future elections. All-mail voting: A ballot is automatically sent to every registered voter in the state a few weeks before Election Day; it can be mailed back or dropped off at designated collection points. States may make certain locations and services available for people who want to vote in person. In several states, in fact, the “alternative” has become the norm. In 2012, there were 12 states – including several that are battlegrounds this year – in which nontraditional voting methods accounted for more than half the total vote. In North Carolina, for instance, early and absentee voting yielded nearly 2.8 million of the state’s total 4.5 million votes. 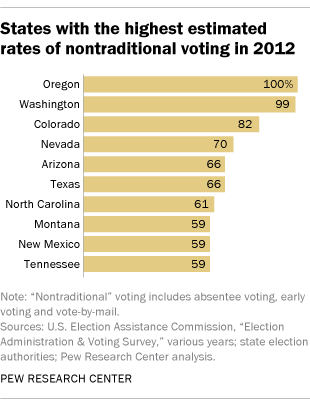 In Arizona, nearly two-thirds of the 2012 vote was cast absentee. In Florida, early and absentee balloting each accounted for well over a quarter of the total vote; only 44% of Florida’s voters cast their ballots in the traditional way. And in Oregon and Washington, elections already were conducted entirely by mail (they’re being joined by Colorado starting this year). Absentee voting began during the Civil War as a convenience for Union soldiers in the field. By the middle of the 20th century, most states had adopted some form of absentee balloting, for civilians as well as members of the military, though typically it was restricted by residency and other requirements (such as limiting the practice to people who physically could not get to the polls or would be away from home on Election Day). In the 1970s and ’80s, states began experimenting with other types of nontraditional voting. Eliminating special residency requirements and the need for a specific excuse to vote absentee was a common first step: California, Oregon and Washington were among the first states to introduce “no-excuse” absentee voting. Today, 27 states and the District of Columbia offer no-excuse absentee voting, compared with just 11 in 1992. 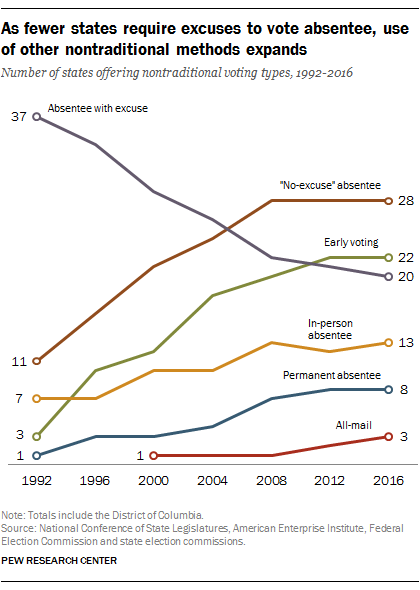 In 20 states, absentee voting still requires an excuse, down from 37 in 1992. However, seven of those 20 states offer one or more other forms of nontraditional voting as well. 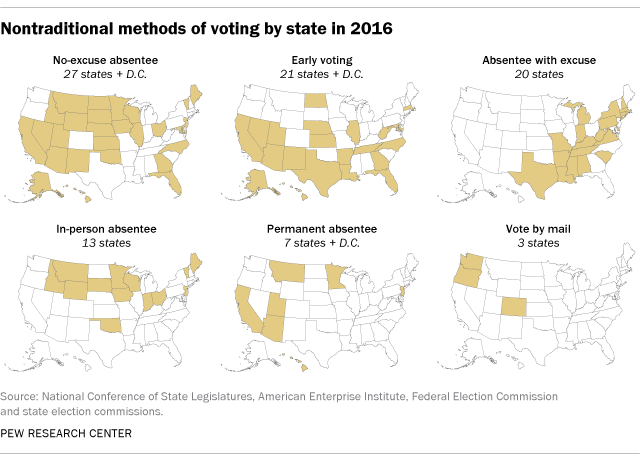 Today, 38 states offer one or more types of nontraditional voting beyond the traditional absentee voting with an excuse, more than twice as many as in 1992. Many states now offer early voting, which lets voters go to an elections office (or, in some cases, a satellite voting location) and cast their vote with no excuse necessary. With Massachusetts offering early voting for the first time this year, 21 states and the District now offer some type of early voting – seven times as many as in 1992. More recently, however, some states have scaled back their early voting periods. In 2014, for example, Ohio cut its early-voting period from 35 days to 29 days before Election Day, in the process eliminating a six-day period (called “Golden Week”) in which voters could register and vote early all in one trip; earlier this year, a federal appeals panel upheld that change. North Carolina, South Dakota, Tennessee and Nebraska are among other states that have limited early voting in the past few years. Another type of nontraditional voting, generally referred to as “in-person absentee” voting, resembles early voting. But unlike early voting, which allows all qualified voters to vote during a specific time window before Election Day, in-person absentee voting allows absentee voters (excused or no-excuse) to fill out and drop off their absentee ballots in person, rather than through the mail, at any time prior to Election Day. Although in-person absentee voting was available in Idaho, Iowa and some other states prior to 1992, this option didn’t gain steam until the 1990s. Combining in-person absentee voting and early voting as one category, 34 states and D.C. offer some form of pre-Election Day voting. In seven states and D.C., voters can apply to be added to a “permanent absentee” voter list, in which they automatically receive mail ballots for future elections. Hawaii first offered permanent absentee voting in 1975 (along with early voting), and other states followed in the 1990s and 2000s. Three states – Oregon, Washington and now Colorado – have gone one step further and enacted vote-by-mail systems for all elections. In vote-by-mail states, all registered voters receive their ballots in the mail several weeks before Election Day; voters can fill out their ballots at their leisure and either mail them back or drop them off at designated collection points at any time up to the close of Election Day. Oregon pioneered this method when it went all-mail in 2000 (although it held smaller, local all-mail elections as far back as 1981). Washington and Colorado followed suit in 2011 and 2013, respectively. Officials in California also have discussed the possibility of the Golden State going all-mail. We used a combination of sources to produce our estimates. Besides the AEI study, we relied for the most part on reports published by the U.S. Election Assistance Commission following the 2004, 2008 and 2012 elections (the commission was created in 2002). Those reports compiled data reported by state elections authorities to the EAC shortly after the November election. Where those data were missing, inconclusive or contradictory, we went back to the individual state election authorities to try to fill in as many gaps as possible. Though our findings are necessarily approximations, we sought to survey the nontraditional voting landscape in the U.S. over the last quarter-century as accurately as possible. According to figures compiled by voting and turnout expert Michael McDonald of the University of Florida, nearly 4.3 million votes already have been cast, either by mail or in person. If the recent past is any guide, that figure is likely to rise steeply as Election Day draws nearer.